I wrote a couple of posts on Occupy activism at UC Davis after campus police drenched peaceful student protesters with pepper spray, an even that launched the local occupation into the national spotlight. Here I point out that student activism on campus had been ongoing for several years. Students had supported workers on campus as they fought subcontracting and had often protested tuition hikes. The post originally appeared on the Possible Futures blog, hosted by the Social Science Research Council, on November 22, 2011. On November 9th students and faculty at the University of California, Berkeley, were manhandled and hit with batons as campus police attempted to dismantle tents that had been erected as part of an Occupy protest. During the following week, protests of support emerged on other UC campuses, including the campus where I work, UC Davis. On Friday, November 18th, UC Davis campus police were utilized to forcibly dismantle the tents that had been set up on the campus quad in solidarity with protesters elsewhere and Occupy activists in the City of Davis (there has been an ongoing occupy protest in Davis’s Central Park for the past several weeks). The police turned out in riot gear despite the very small number of students and the peaceful nature of their protest. Some students refused a request to disperse and were intentionally pepper sprayed. There was no obvious reason to spray the students. They were not doing much of anything other than refusing a request to leave. Numerous videos of the incident were posted online and, for whatever reason, went viral. On Sunday, November 20th, one of the videos posted to YouTube had been viewed over one million times. UC Davis has become the center of a national conversation about the Occupy protests and, by Sunday morning, the focus of international news coverage and, in the words of London’s Telegraph, “international outrage.” A libertarian blogger at Forbes found police behavior at UC Davis “absurd” and an example of the militarization of police, despite having no great sympathy with the protesters themselves. The New York Times even weighed in. In a post to the newspaper’s “The Lede” blog, Brian Stelter gave a concise account of the event that was nonetheless sympathetic to the protesters. Sunday morning news shows on November 20th took up the issue. On Fox News Sunday the question was whether protesters had issues relevant to the nation as a whole or whether they were simply “violent.” The filmmaker Michael Moore demanded the resignation of Linda Katehi, the university’s chancellor. In many of these discussions, the protest and police response at UC Davis has provided fodder for national discussions about the Occupy movement more generally. Do the protesters have legitimate grievances? Do they have the right to occupy public space as a protest tactic? What level of police response is appropriate and how far do constitutional rights extend? But lost in these discussions is the fact that the protests at UC are not simply protests of support for the Occupy movement. This is not a case of young impressionable students looking for a cause and finding it in the Occupy movement. It is true that encampments have been created on several UC campuses and that the occupation of public space in this manner has been widely imitated. It is also true that student activists are generally supportive of the Occupy movement’s critique of financial power. But the fact is: the events at UC Berkeley and UC Davis over the past few weeks have been a continuation of an ongoing campus protest movement against the privatization of the university. The UC system has long been a publicly supported university system and, in its heyday, it was the global model for public university systems. 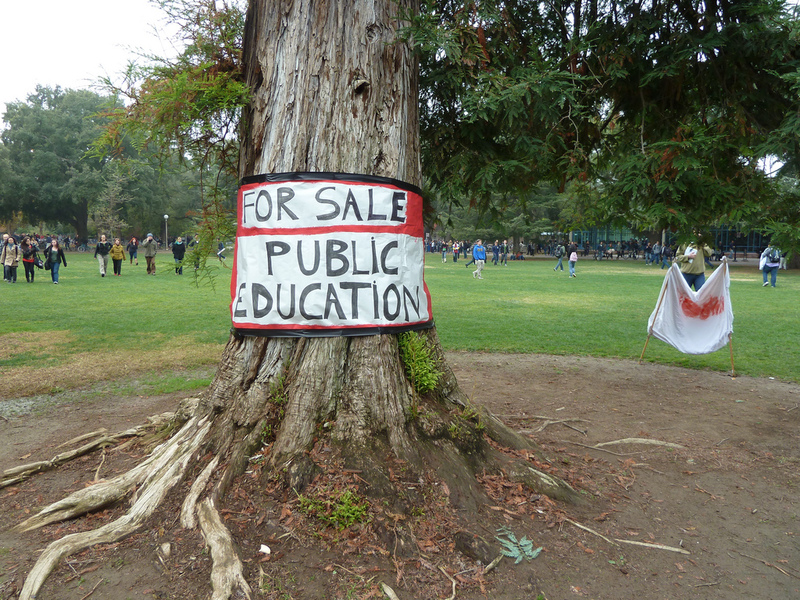 Education was either free or very cheap and it was one of the best educations one could get anywhere (California’s K-12 public education system was also the best in the nation). However, for many years now, the basic state-based funding mechanisms that had enabled the university to flourish have been dismantled. Part of this is due to the many constraints on the state legislature on issues of budgeting and taxation. Another is that other priorities have clearly taken precedence over higher education, including the prisons necessary for incarcerating large numbers of non-violent drug offenders. When he was governor Arnold Schwarzenegger even proposed a constitutional amendment that would bar the state from spending more on prisons than it spends on higher education. The state now spends about 12 percent of the budget on prisons and 7 percent on public university education. The state no longer meets its basic obligations to the university. For example, it no longer subsidizes all in-state students despite a long-standing commitment to do so. The University has to make up the difference or exclude qualified students. In this context, the University has been forced to adapt to a new environment in which state support is shrinking and unreliable. The result has been several rounds of cuts, administrative restructurings, furloughs, voluntary and involuntary layoffs, wage and salary freezes, subcontracting out of various functions that were once handled in-house, pressure to increase class sizes, the sale of intellectual property and resources to corporations, and, last but definitely not least for this discussion, tuition increases. Fees and tuition for in-state students are now over $13,000/year (out of state students pay nearly three times that amount) and this sum does not include room and board, health insurance, books, and so on. Moreover, these tuition costs are new. Students have been hit with several annual tuition increases of 30 percent or more. The University plans to continue increasing fees through 2016. By then, fees will be 80 percent higher than they are today. Students are not the only ones feeling the pinch, though they have perhaps borne the largest share of the costs. University workers have had their employment shifted from unionized and well-paid campus jobs to non-union and poorly paid subcontractors. Graduate students have seen diminishing support despite being a central component of undergraduate education (UC graduate students recently unionized). Faculty have seen temporary pay cuts, limited hiring, and diminished support, though their problems are minimal compared to other University constituencies. There have been some aspects of the reorganization of UC that shed light on what happened at UC Berkeley and UC Davis over the last few weeks. First, the university administration has consistently abdicated any responsibility for what is happening or how it is happening. The administration consistently blames politicians for its predicament or blames the broader environment. It justifies reorganization in the name of competitiveness, which is certainly worthwhile, but without much consideration at all of the costs to the mission of the University. Second, the Regents who govern UC are political appointees that have many and close ties to the financial industry. Many involved in the protests question why the governance of the system is in the hands of people who do not have much experience with higher education. More critical voices note the financial connections many regents have and see an inherent conflict of interest. Why wouldn’t Regents want to raise tuition? After all, that simply creates business for financial institutions that provide student loads. Third, students have protested every announced tuition increase. These protests have been intermittent but persistent over the last several years. At UC Davis students have blocked traffic on city streets and, at one point, attempted to stop traffic on I-80. These protests have often been coordinated with protests undertaken by campus workers and their union representatives, as well as the graduate student union. Fourth, these protests have never been met with the sort of response evident on November 18th and, indeed, have at times demonstrated some pretty sophisticated negotiation on the part of both activists and officers to defuse tense situations. The protests on UC campuses do have affinities with the Occupy movement in general. Most obviously, young people are protesting diminished opportunity and the abdication of responsibility by the leaders of corrupt institutions. However, for UC students the issue is less abstract. Loss of opportunity is felt keenly by students when tuition goes up 30 percent per year and they can’t get into overenrolled classes. It is felt when they are forced to take out expensive loans—loans which constrain the employment and educational options of graduating seniors. The financialization of the economy does not merely concern credit default swaps and housing. The dynamics of polarizing income, indebtedness, and reduced opportunity are felt keenly by university students. But the protests at UC Davis are not a mere manifestation of the Occupy movement. It is a movement with its own trajectory and its own voice. Whatever else it did, the assault by campus police on peaceful, if defiant, students has galvanized a massive response. While many at the University have been dismayed by changes to it, there was not nearly enough anger to move large numbers of students and faculty out of their daily routines. The incident on Friday had little to do with the issues that have animated protest. Whatever else we who work at the University are, we are educators. For the most part we like students and we want them to succeed. It may be that the sight of our own institution demonstrating such contempt for the constituents that justify its very existence is a bit too much to witness without objection. To me, the incident signifies how concern for the students and their education has become an increasingly distant one for the University.